With its riches-to-rags-to-riches history, lively arts scene, and proactive planning and community building, Midtown Atlanta is the preeminent urban neighborhood in Atlanta. It stands out as a dense, mixed-use walkable area in a region traditionally known for its decades of sprawling growth. Midtown Atlanta is bordered to the north by the Amtrak Station and to the south by Pine Street near its medical district. It extends east to the edge of Piedmont Park, near the Atlanta BeltLine Eastside Trail, and to the west at Interstate 85/75. 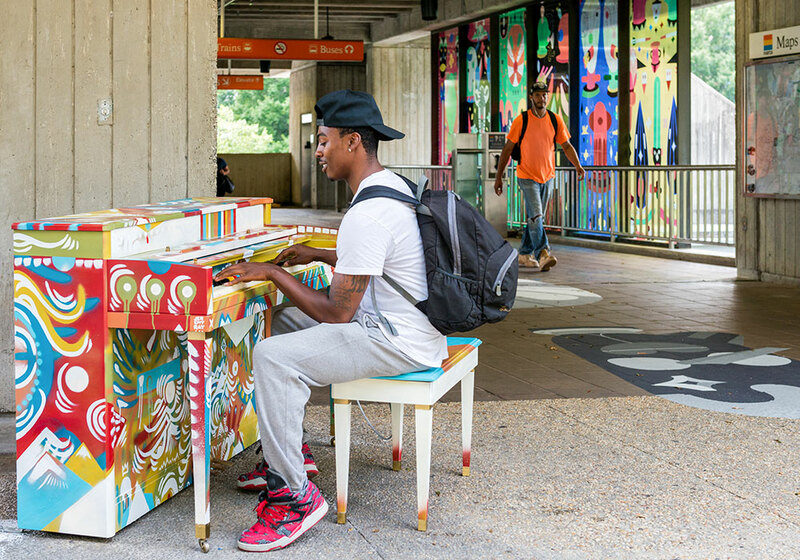 Midtown Alliance partnered with a regional transit authority and a local arts institution to create a colorful plaza activation in the arts district, including a community piano and whimsical treatments. Photo courtesy Midtown Alliance. In the early 1900s, Midtown Atlanta emerged from pine forest to become one of Atlanta's finest neighborhoods, but people began to leave the city for Atlanta's growing suburbs after World War II. By the 1960s, Midtown was best known for counterculture, unsavory streets, and blight. Midtown Alliance emerged as the organization for the collective action of community, civic and business groups, and began the process of transforming this part of Atlanta into a true mixed-use, new urbanist, live-learn-work-play community. In the late 1990s, Midtown Alliance worked with the City of Atlanta on a “Blueprint Midtown” master plan that led to the largest rezoning effort in the city’s history — ensuring appropriate densities, a mix of uses, and a walkable and active street experience. These efforts have led to almost $5 billion in new private investment since 2000 in this 1.2-square-mile urban core. Today, Midtown Atlanta is a blend of commercial enterprise, arts and cultural attractions, higher education, residential living, and greenspace. Midtown Atlanta is Atlanta’s “heart of the arts,” featuring the largest concentration of arts and cultural attractions in the Southeast. It also has emerged as a powerful innovation district with substantial anchor institutions including Georgia Tech, Emory University Hospital Midtown, and the Savannah College of Art and Design-Atlanta. In a region where land use and transportation conditions have been heavily influenced by low-density, auto-dominated decision making, Midtown Atlanta stands out for its focus on pedestrians. Arranged on a tight street grid of 120 blocks, Midtown Atlanta is dense and walkable and accommodates many multiuse buildings. As the district has grown, tens of millions of dollars have been invested in enhancement projects ranging from streetscaping and sidewalk improvements to transit station enhancements and bike lanes. Four rail transit stations serve Midtown Atlanta as part of the Metropolitan Atlanta Rapid Transit Authority (MARTA) network, and are reachable on foot within a six-minute walk from 96 percent of the neighborhood’s commercial and residential buildings. Midtown Alliance also works with more than 150 employers on commuter programs aimed at getting car drivers to take transit, rideshare, or bike to work. Atlanta's signature street, Peachtree Street is a central destination in the Midtown neighborhood that is used for season "open streets" community events, where motor vehicle traffic is limited for a few hours. Photo courtesy of Midtown Alliance. The neighborhood is known for its dense growth and grid street network. Midtown Atlanta has a diverse range of housing and building uses and developments. As of Summer 2016, 20 major mixed-use development projects were actively under construction, including residential apartments, condos and townhomes ranging from 2-25 stories, offices, institutional, hotels, and street-level restaurant/retail uses. This area welcomes six million annual visitors each year, with major attractions including arts, culture, and the 230-acre Piedmont Park. The unique historic architecture of the Fox Theatre, a Midtown Atlanta landmark, displays Moorish styling, with minarets and a central dome. Built as a temple for Atlanta’s Shriners organization, the venue changed hands several times, once serving as a movie palace, then sitting in disrepair, and today emerging as one of America’s top performance venues. Top-ranked anchor institutions bridging technology, healthcare, and the arts foster innovation among corporations, start-ups, and entrepreneurs in Midtown Atlanta’s Technology Square area. Midtown Atlanta boasts more than 2,200 street trees in the public right of way, and a growing array of pocket parks, outdoor cafes, and street activities. Midtown Atlanta demonstrates a strong focus on environmental sustainability, including the creation of an Ecodistrict, and the Midtown Luminaries program that recognizes buildings and companies striving for sustainability. Midtown Atlanta participates in Atlanta Streets Alive, which closes iconic Peachtree Street to cars one weekend afternoon in June and October so cyclists and pedestrians can follow a pre-determined route through the city. With construction funding from the Atlanta Regional Commission and the Midtown Improvement District, Midtown Alliance's $5.6 million renovation of 12 blocks of Juniper Street will include a buffered bicycle lane, on-street parking, and stormwater catchment and mitigation areas in addition to sidewalk, lighting, and landscape improvements. Midtown Alliance, in cooperation with other partners, is undertaking a series of projects to transform the I-75/85 Connector through environmental and urban design improvements. Construction enhancements of the two Peachtree Street bridges over I-75/85 will finish by end of 2016. A second phase will look at improving the 10th Street Bridge with new gateway features, bridge fencing, lighting, and improved pedestrian and bicycle facilities. Music Midtown turns nearby Piedmont Park into the hottest outdoor concert venue in town for one weekend in September. The festival features popular pop, rock, hip-hop, and electronic acts; local treats; and great views of the Midtown skyline. Peachtree Road Race, the largest 10K in the world, kicks off Fourth of July festivities in Midtown Atlanta. In June, Midtown Atlanta hosts the Atlanta Food & Wine Festival, a series of classes, tasting experiences, and meals featuring the best of Southern cuisine. Food enthusiasts from around the region convene in Midtown Atlanta for Taste of Atlanta in October, a three-day food festival where more than 90 neighborhood favorites feature their most delicious dishes and local chefs participate in live demonstrations. 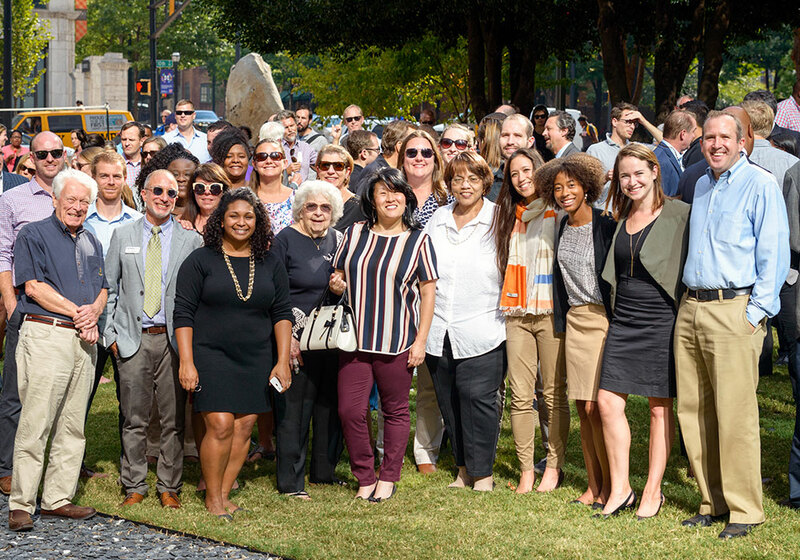 More than 200 business and civic leaders, residents and workers turned out for a special pop-up event to celebrate Midtown Atlanta's recent win as one of only five neighborhoods in the country to make the American Planning Association's 2016 list of "Great Places in America." 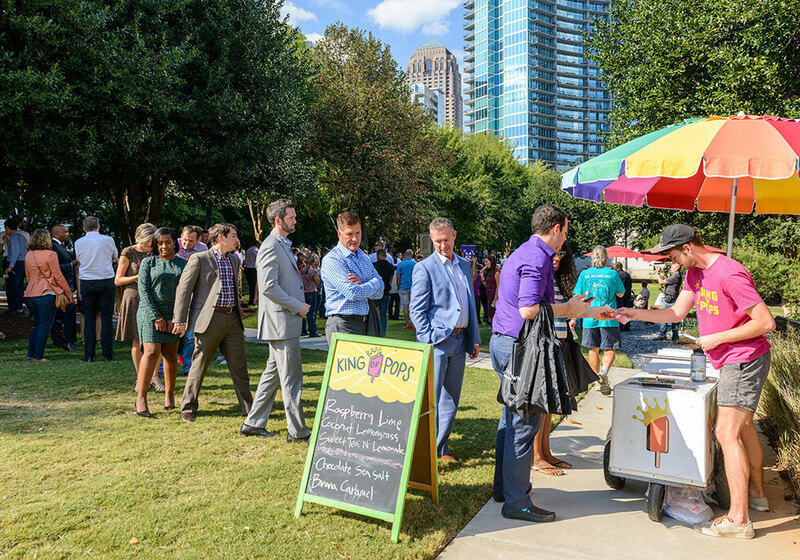 Attendees enjoyed free King of Pops popsicles on the lawn of a temporary park space in the heart of Midtown at the event, which featured remarks from City of Atlanta Mayor Kasim Reed. Photo courtesy Midtown Alliance. Attendees at the Midtown Atlanta Great Places in America event. Photo courtesy Midtown Alliance. 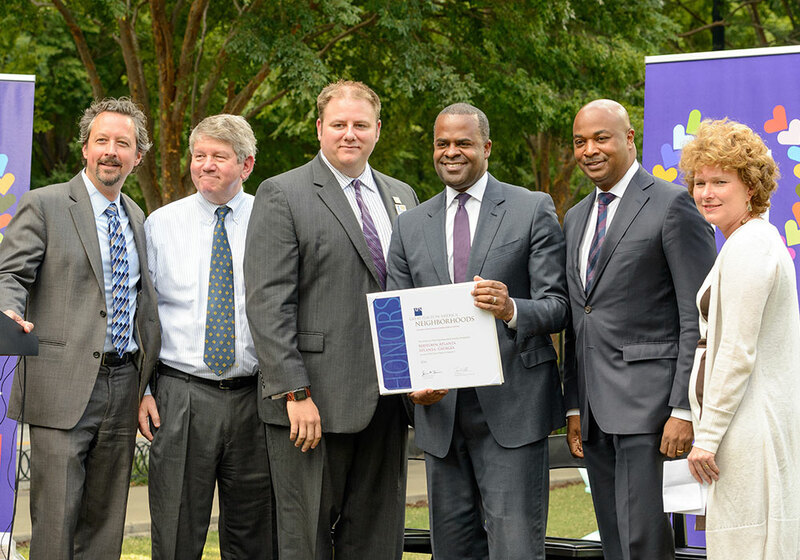 Representatives from the City of Atlanta and Midtown Alliance receive a special designation from the American Planning Association (APA), recognizing the Midtown Atlanta neighborhood as one of APA’s 2016 “Great Places in America.” From L-R: Kevin Green, CEO, Midtown Alliance; Joe Bankoff, Chairman, Midtown Alliance; Corey Hull, AICP, APA Georgia Chapter President; The Hon. Kasim Reed, Mayor, City of Atlanta; The Hon. Kwanza Hall, Council Member, Atlanta City Council; Shannon Powell, COO, Midtown Alliance. Photo courtesy Midtown Alliance.